Arthritis is one of the most prolific diseases in the UK and can occur in people of any age. The literal meaning of arthritis is 'pain within a joint' and is therefore used in connection with a number of different conditions. Although there is no cure for arthritis, there are many treatment options available. It is important to seek help early so that treatment can begin as soon as possible. With treatment, people with arthritis are able to manage pain, stay active, and live fulfilling lives, often without surgery. Unlike osteoarthritis which follows a predictable pattern in certain joints, rheumatoid arthritis is a system-wide disease. It is an inflammatory disease where the patient's own immune system attacks and destroys cartilage. The exact cause of rheumatoid arthritis is not known. Although it is not an inherited disease, researchers believe that some people have genes that make them more susceptible. There is usually a "trigger," such as an infection or environmental factor, which activates the genes. When the body is exposed to this trigger, the immune system begins to produce substances that attack the joint and this leads to rheumatoid arthritis. Post-traumatic arthritis can develop after an injury to the foot or ankle. This type of arthritis is similar to osteoarthritis and may develop years after a fracture, severe sprain, or ligament injury. Fractures, particularly those that damage the joint surface and dislocations are the most common injuries that lead to this type of arthritis. An injured joint is about seven times more likely to become arthritic, even if the injury is properly treated. In fact, following injury, your body can secrete hormones that stimulate the death of your cartilage cells. 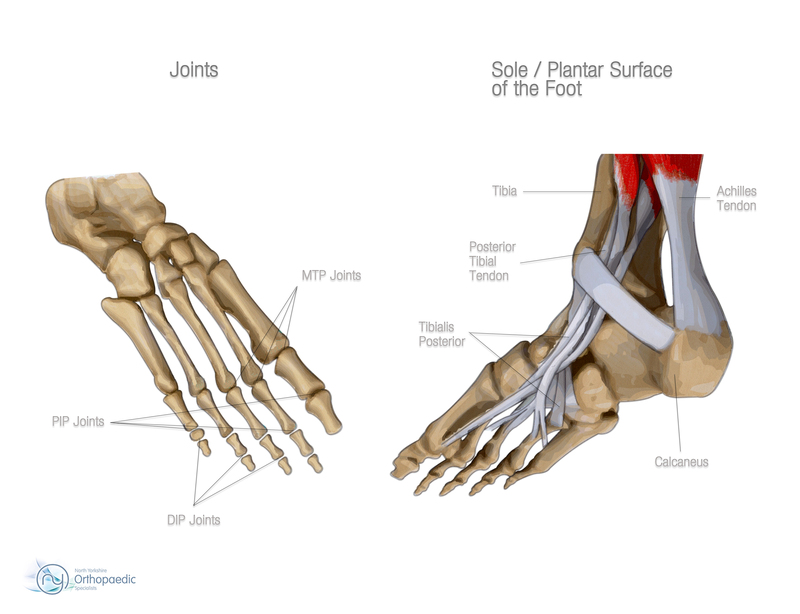 To understand more the condition of arthritis, it is useful to understand some of the basic anatomy about the foot and ankle. 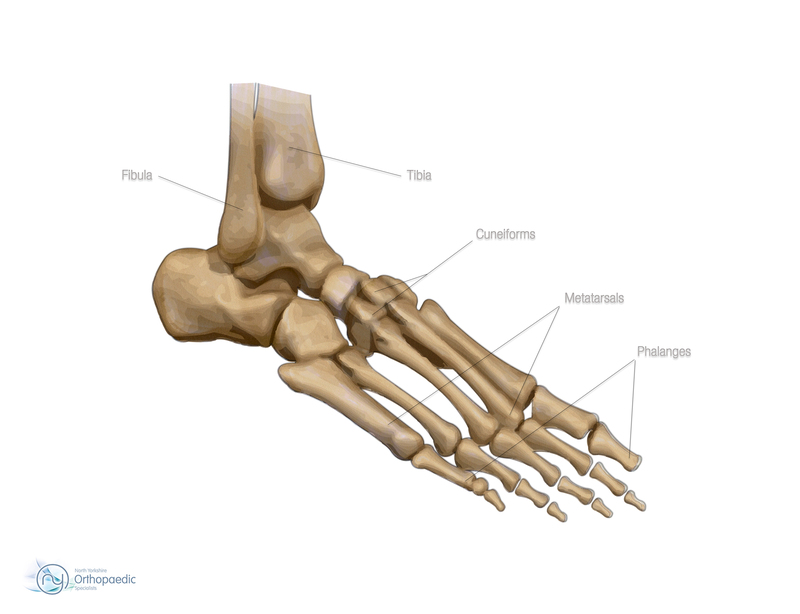 There are 28 bones and more than 30 joints in the foot. Tough bands of tissue, called ligaments, keep the bones and joints in place. If arthritis develops in one or more of these joints, balance and walking may be affected. Your Consultant will base a diagnosis using your medical history, symptoms, a physical examination, and results from disgnostic imaging. One of the tests performed during the physical examination is the gait analysis. 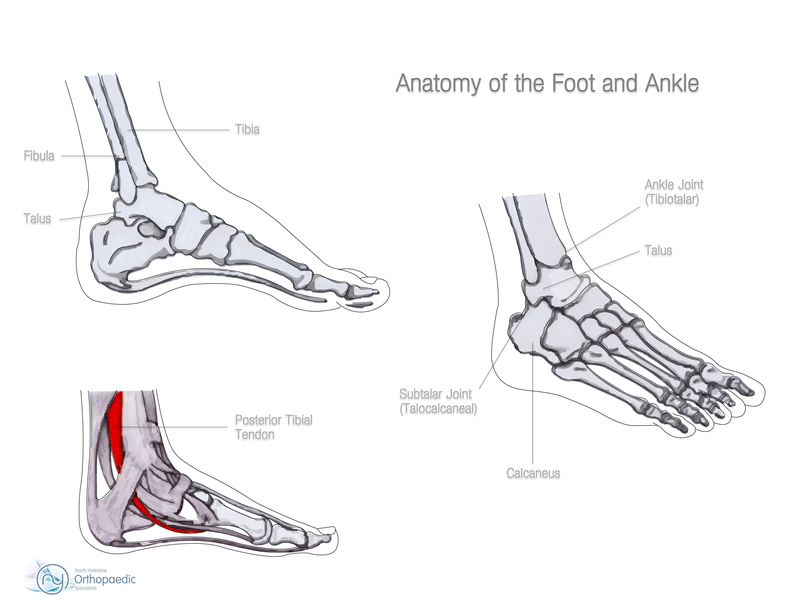 This shows how the bones in the leg and foot line up with walking, measures stride, and tests the strength of the ankles and feet. If arthritis doesn't respond to nonsurgical treatment, surgical treatment might be considered. The choice of surgery will depend on the type of arthritis, the impact of the disease on the joints, and the location of the arthritis. Sometimes more than one type of surgery will be needed. 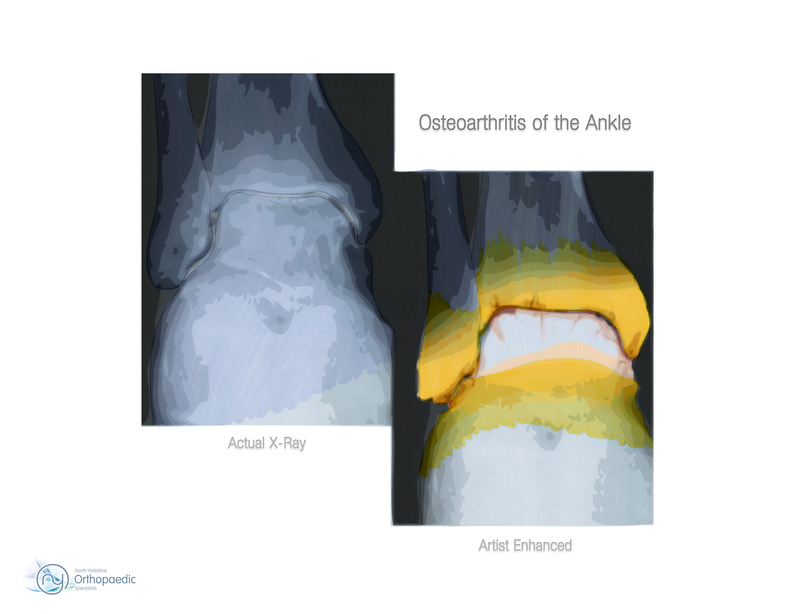 Surgery performed for arthritis on the foot and ankle include arthroscopic debridement, arthrodesis (or fusion of the joints), and arthroplasty (replacement of the affected joint). Arthroscopic (key-hole) surgery is often used in the early stages of arthritis. 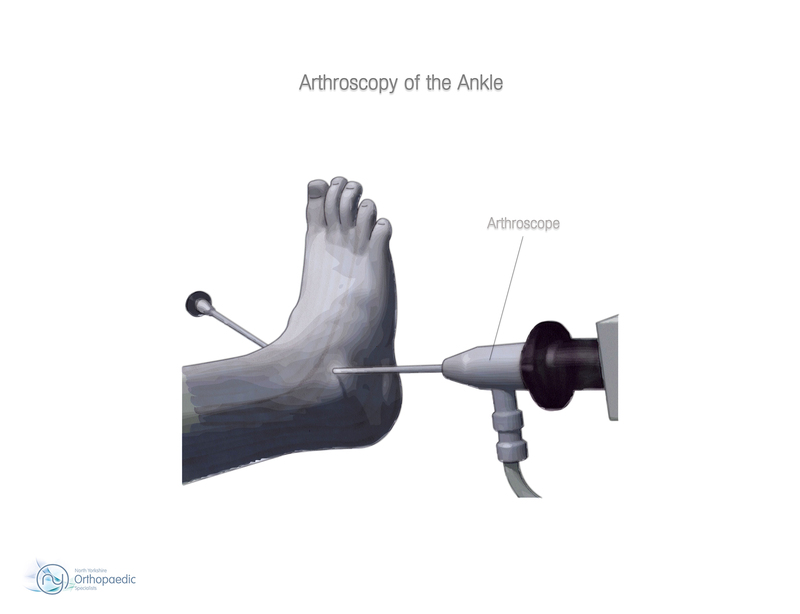 A flexible, fiberoptic pencil-sized instrument (arthroscope) is inserted into the joint through a series of small incisions through the skin. The arthroscope is fitted with a small camera and lighting system, as well as various instruments. The camera projects images of the joint on a television monitor. This enables the surgeon to look directly inside the joint and identify the problem areas. Small instruments at the end of the arthroscope, such as probes, forceps, knives, and shavers, are used to clean the joint area of foreign tissue, inflamed tissue that lines the joint, and bony outgrowths (spurs). Arthrodesis fuses the bones of the joint completely, making one continuous bone. The consultant uses pins, plates and screws, or rods to hold the bones in the proper position while the joint(s) fuse. If the joints do not fuse (nonunion), this hardware may break. A bone graft is sometimes needed if there is bone loss. The su may use a graft (a piece of bone, taken from one of the lower leg bones or the wing of the pelvis) to replace the missing bone. This surgery is typically quite successful. A very small percentage of patients have problems with wound healing. These problems can be addressed by bracing or additional surgery. 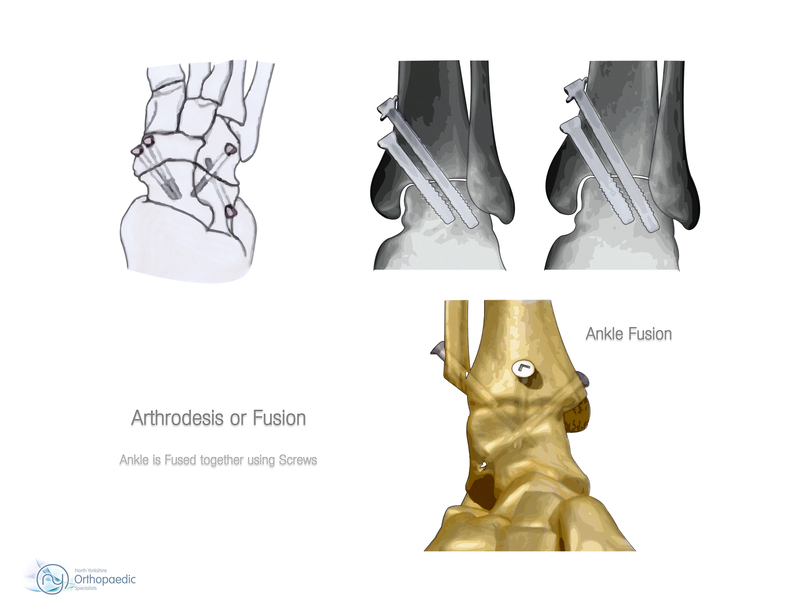 The biggest long-term problem with fusion is the development of arthritis at the joints adjacent to those fused. This occurs from increased stresses applied to the adjacent joints. 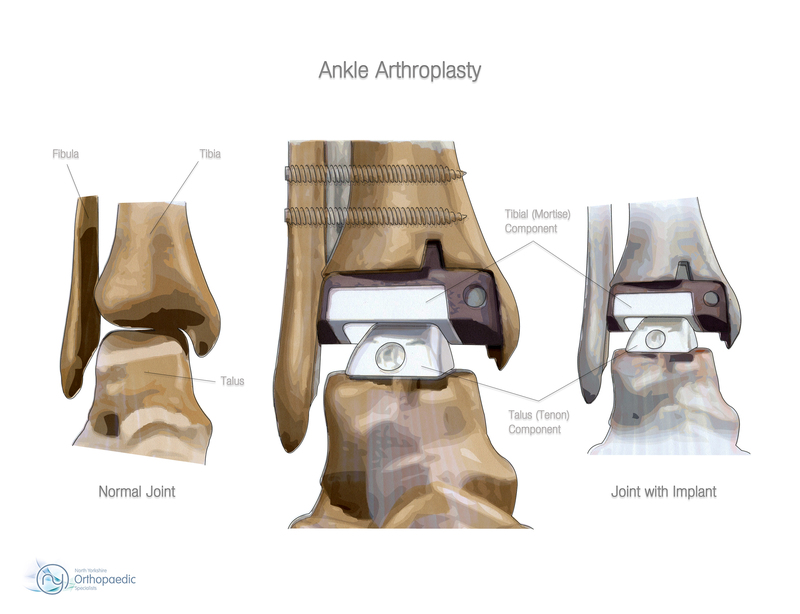 In arthroplasty, the damaged ankle joint is replaced with an artificial implant (prosthesis). Although not as common as as total hip or knee joint replacement, advances in implant design have made ankle replacement a feasible option for many people. In addition to providing pain relief from arthritis, ankle replacements offer patients better mobility and movement compared to fusion. By allowing motion at the formerly arthritic joint, less stress is transferred to the adjacent joints. Less stress results in reduced occurance of adjacent joint arthritis. Details or actual surgical procedures can be seen under treatments. What should be remembered is that although in most cases, surgery relieves pain and makes it easier to perform daily activities, full recovery takes four to nine months, depending on the severity of your condition before surgery, and the complexity of your procedure.